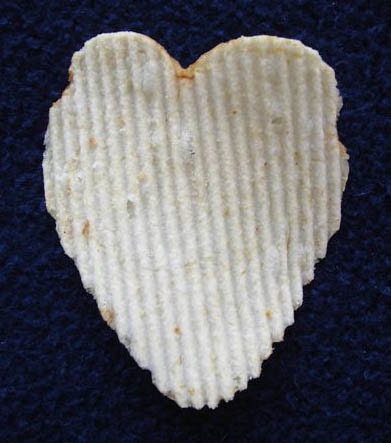 This carefully-preserved, one-of-a-kind, heart-shaped Ruffles potato chip was found in a bag of chips about six months ago. The chip has not been modified at all, but is the original shape of the chip as it was found in the bag! We decided to eBay this unique gem of a collectors item. 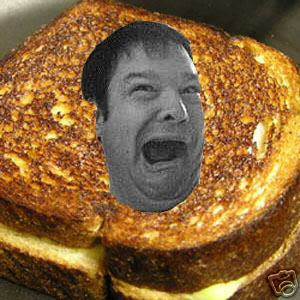 Hey, if people can sell grilled cheese sandwiches with faces on them, why not? I did a little searching on eBay for weird food things, and came across this hilarious grilled cheese sandwich for sale. It's obviously a joke, but I really wonder what I would get if I paid the $2 plus $5 for shipping. I got this Heart shaped Potato Chip in a bag of Great Value Potato Chips...Do you think you can ebay this ?